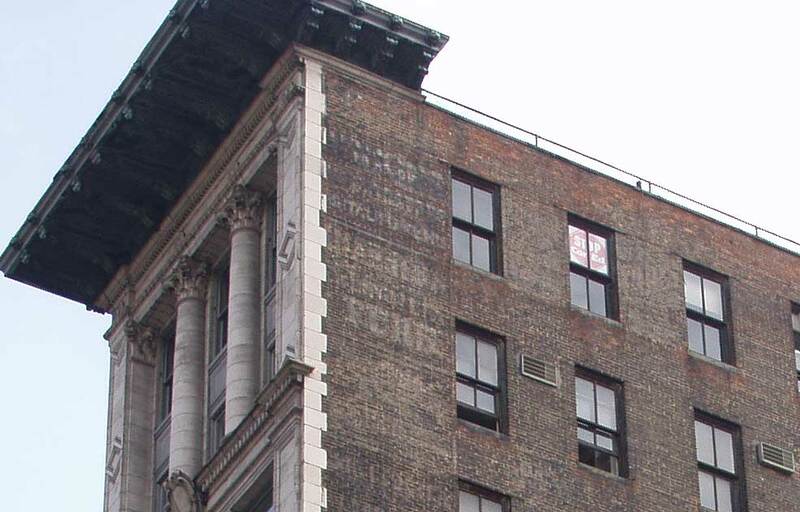 Two signs from the top of this building with the prominent cornice and corinthian columns are the very faded remains of Harris & Freedman Furs (click for detail). They were Samuel Harris (1871?-1952) and Simon Freedman, furriers, in partnership about 2 years, 1914 to 1915, at this address. Harris then had a new partner, Abraham Dubin (1886-1964), for a couple of years (1915 to 1916) at this same address. This was followed by Harris and Rosenblum at 36 W. 25th St. from 1917 to 1922. Rosenblum was Isadore Rosenblum (1887/88-1949). Isadore Rosenblum then had a partner, Jacob Haberman (1890-1957), at Rosenblum & Haberman, who were in business at 24 W. 57th St. from 1923 to 1933. Haberman continued alone at 24 W. 57th St. and later at 150 W. 30th St. until his death in 1957. Further down the wall is another faded remnant: I M Jawitz & Son Furs (click for detail). Jawitz, father and son, were born in Austria (Bohemia). Israel Moses Jawitz (ca.1861-1934?) appears on the ship's manifest of the SS Noordland sailing from Antwerp 15 April 1899. His son, Philip Jawitz (1885-?) had his own company on Central Ave., Jersey City, N.J. at the time he registered for the World War I draft in 1918. Jawitz père was in business on Greene St. from around 1907. This became I. M. Jawitz & Son in 1909. They moved to 24-26 W. 30th St. in 1911, and were located here until 1915/16. The company went out of business around 1919. Then at the very bottom the letters J H F appear clearly against the white marble at the corner (click for detail), while the rest of this sign fades against the brick. It appears to say Julius Frankel / Henry L Gilbert / Furriers.